I feel incredibly guilty admitting this, but this summer I found myself dreading going back to work. I didn't feel the spark that excited me to try new things with my kiddos. Last year was incredible. I got to team teach with my best friend on campus who happened to have my son in her class. It was the greatest gift to get to watch him develop over the course of the year. As school was approaching, this guilt really began to weigh on me. I wouldn't want my child to be in a class where the teacher wasn't totally excited to be there! Then, a good friend at my site got an opportunity to be an assistant principal which opened up a spot in a 2/3 combo. It wasn't really even a question in my mind, I just knew I needed a change and applied for the position. So fast forward to now... I actually have to teach this! So I come to you today to ask for your expertise. Language arts, social studies, science... I can make those work in a combo. The math however... that's a different story. We haven't done much of the math together. There may be times when we can, and I feel like after I live in these standards for the year, I will be much better at finding and creating tasks that we could do together. The hardest part for me is that third grade is off and running early with multiplication and division so they can meet those fluency expectations and second grade needs to lay the foundation for that understanding first. After spending some time on "Inspirational Math" from Youcubed, we began the year with both grades working on defining equal. We worked with equal groups and balanced equations. Since then, second graders have been working on the idea of unitizing. 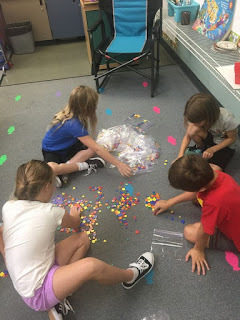 In first grade (after a great deal of time and experiences) students worked with tens and built an understanding that ten ones is equivalent to a ten. Now, my goal for the second graders is to apply that understanding and extend it to hundreds and eventually thousands. My goal is for them is to see that this structure keeps going and it will work every time. In third grade, we began with equal groups at the start of the year. 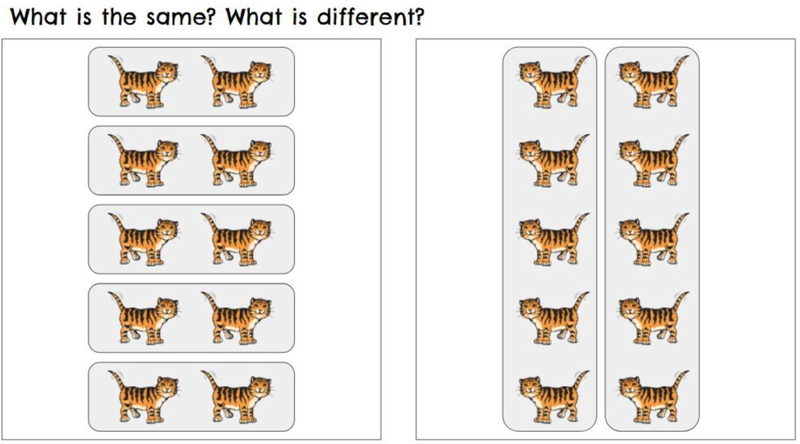 We spend a few minutes on counting circles several times a week and look at the patterns that occur when skip counting. Today, I asked the kids why they thought we took the time to practice skip counting in our counting circles. One said to practice adding (formative assessment time for me) and others said because it helps them multiply. We opened multiplication with conceptual subitizing. First, I showed them 30 dots that were not organized at all and they wouldn't have much of a chance at knowing how many dots were there with just a second or two to count them. I asked the kids how many dots they saw... All I saw was uncomfortable kids. I said, okay let's try it again. This time I showed them 30 dots again, but organized into a familiar pattern - there were six groups of 5 similar to a dice pattern. Immediately kids said there were 30. We had a big discussion about how they knew and what made it so much easier the second time. The kids said, "grouping." That was our starting point. Since then we have continued to work on the meaning of multiplication, that it means groups of. Then, the kids discovered division and linked it to multiplication. 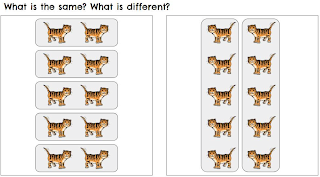 Since then, we have been working on various tasks with multiplication and division highlighting the different strategies children use along the way. Today we also did a math journal entry about the image below. Answering the questions: What is the same? What is different? I am having so much fun learning with these amazing kids! It's SO MUCH WORK (seriously overwhelming when you're trying to do it right in all subject areas) but I am really enjoying it! Please share your insights in the comments! I need all the help I can get this year! This sounds like an amazing beginning to the year! 2nd/3rd mix does sound complicated. Do you know about this list of teachers by grade/course (tabs on bottom)? They might be a good resource.